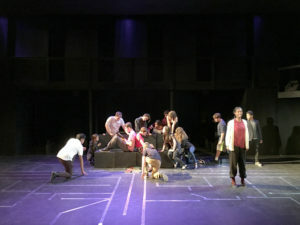 Hannon Theatre Company rehearses a scene for ‘Fahrenheit 451.’ The play ran from Nov. 11-19 with a total of six showings. Hannon Theatre Company’s Fall production, ‘Fahrenheit 451,’ is based on the classic American novel by Ray Bradbury. In a tale from the future, firemen don’t extinguish fires – they burn books. Reading is banned in the interest of maintaining homeland security. There were six performances from Nov. 11-19. Rehearsals were held three to four times a week, and the crew worked behind the scenes to build the set. Sophomore Jack Saade, member of the stage crew, expressed a few reasons for why he joined HTC. Director of ‘Fahrenheit 451’ Walter Wolfe worked with the actors in the weeks leading up to the performance. “I was worried that our ideas were kind of out there, but luckily our initial concept came through, and people really responded to it. It ended up being more than I had ever hoped for,” Wolfe said. The music accompanying the play is the work of Steven Speciale, who composed each song himself. 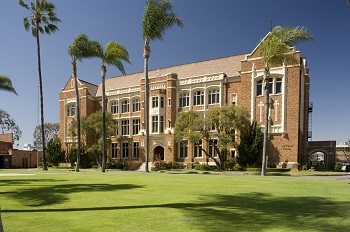 Senior Eleanor Hammond, student at Episcopal School of Los Angeles and the actress behind Mildred, said that performing in ‘Fahrenheit 451’ offered unique social commentary still pertinent to today. 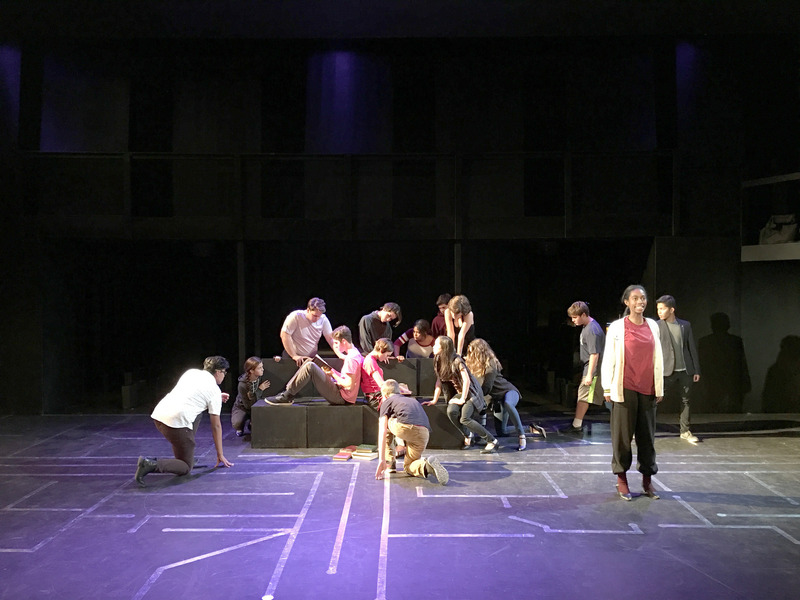 From imitating cars to making up the mechanical hound, the ensemble created the backbone of the play. Freshman Steven Townsend was one of the members of the ensemble. “It was a very interesting and intriguing production. It was as if something was beckoning to me in the theater. The play went super well .I really enjoyed being in it,” Townsend said. The next production by Hannon Theatre is the spring musical, ‘Once Upon a Mattress,’ which will run from Apr. 27-May 6.